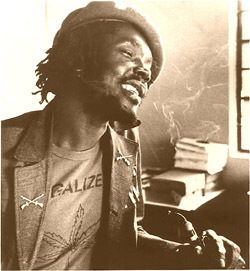 I tend to listen to old dub and reggae, intensively, in spurts. This typically happens every two years, and the past few months have found me back in a place where I am actively seeking new material out. Roughly, the pattern tends to be: I’ll gather a bunch of albums/comps, and it will take me another two years to soak it all up before starting all over again, rummaging through the stacks at the record store. A pattern and a process. Similarly, I have patterns for all sorts of unrelated things in my life. To name several: the music of Led Zeppelin, the films of Woody Allen, Indian food, running, and various BBQ recipes. Anyhow, the DJ Spooky curated In Fine Style: 50,000 Volts of Trojan Records compilation, although released last summer, is fairly new to me. A double disc affair, Spooky mines (not unlike the recent Jonny Greenwood comp) the vast Trojan archives in search of putting together a collection that both hightlights the heavy hitters of the Jamaican Trojan scene as well as some of the lesser known DJs of the day. This works well, because for every Lee Perry, Peter Tosh and Barrington Levy there are handfuls of relatively unknown artists whose work has yet to see the light of day outside of purist and completist circles. With a scene so dense with subcultures, and sub-genres, I for one am appreciative of such an approach. Thanks for a great post. This comp slipped under my radar, and it has great reviews over at amazon.com, so it’s on my Wish List. Thanks for covering it.